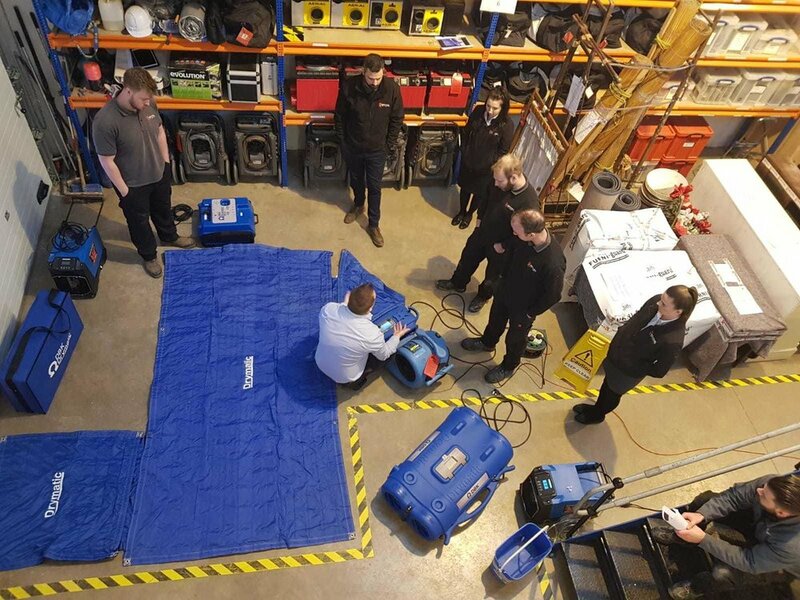 We understand the importance of product training and strive to ensure that every user of the DBK Drymatic System has a technical understanding of how the system works. Learn how to deliver hot, dry air to the water held within the fabric of a building, in a safe and controlled way! We have built a Flood Room in our facility in South Wales so that we can enable hands-on experience with the Drymatic products. Learn how to Measure, Dry Out, and Monitor effectively! Alongside our hands-on training in the Flood Room, we teach you the theory behind our Heat Drying methodology. You will learn how to manipulate material surface temperatures to control evaporation potential and the importance of maintaining control over the ambient conditions. We offer both a 1 Day Course and a more in-depth 3 Day Course! If you can’t free up the time to come to us, we can come to you. DBK offer a cut-down version of our product training that focuses on the key features of each of the Drymatic products. The Toolbox Talk is a great refresher for all stakeholders within your business! Over the past decade, DBK has honed its expertise in the field of Heat Drying. Let us help you develop your business!